A gram of water (about a thimble of water) contains 1023 atoms. (That’s a ‘1’ with 23 zeros after it.) That means there are 1,000,000,000,000,000,000,000,000 atoms in a thimble of water! That’s more atoms than there are drops of water in all the lakes and rivers in the world. Nearly all the mass of an atom is in its nucleus which occupies less than a trillionth of the volume of the atom. They are very dense. If you could pack nuclei like marbles, into something the size of a large pea, they would weigh about a billion tons! That’s 2,000,000,000,000 pounds! More than the weight of 20,000 battle ships! That’s a heavy pea! Thanks for letting me know – I appreciate it. It’s really important to me that my website is a safe and open place for kids to ask their science questions. You found one of the very few experiments listed in the ‘experiments & video’ section that does not have a video because it’s a thought experiment – it happens in your mind. There’s only a couple of these now and then when appropriate so I hope you won’t be too disappointed. If the atom was the size of the earth, the nucleus would be the size of a basketball at the center, and the electron cloud would hover near the surface of the earth. Wild, isn’t it? 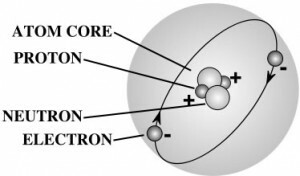 What is in the space between the electrons and the nucleus of an atom? Protons and neutrons are made up of quarks – you can read more about those in the Unit 7: Particle Physics section of Lesson 1. Electrons are as small as they can go – you can’t split one apart to find something else inside. The type of element is determined by the number of protons in the core. The world is made up of LOTS of different type of particles, however all visible matter you and I know through everyday life is only made of up of those three. Think of it like this – all the stories, communication, literature, talks, lectures, etc. in the entire world are all made up of only 26 letters. Every idea ever written down, poetry, music lyric… all made up of only 26 letters in different combinations. The proton, neutron, and electron make up the atoms/elements, which make up the molecules. For example, when you put together one proton and one electron, you get a hydrogen molecule. When you combine two hydrogen and one oxygen, you get the water molecule. The forces involved keep the world from becoming a blob – the strong force keeps the atom’s core together, and the electromagnetic force keeps everything the right distance apart so things don’t fly apart or fall into each other. Great questions – keep it up! 1. If all atomic particles (neutrons, protons, electrons) are made of the same thing, as far as I know, then how does having a different number of protons and neutrons possibly create a different element? If the world is made up of only three different things, then why are there all these different elements? If the world was an element free ‘blob’, then surely a different atomic mass would just make a heavier or lighter bit of blob. 2. What makes a proton and electron have a charge?